Although the majority of holidaymakers staying on Capri, Italy wouldn't dream of leaving this paradisiacal island, not even for a minute, those lucky enough to be here for more than a week of two might well be tempted to make the most of its strategic location in the Bay of Naples and to use it as luxurious base from which to visit the nearby tourist attractions. 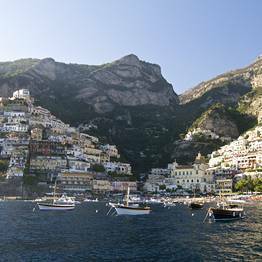 Here are a number of unforgettable day trips from Capri to the neighboring islands and the mainland. Throughout the year, regular ferry crossings transport passengers boarding at Capri to the nearby ports of Naples and Sorrento. 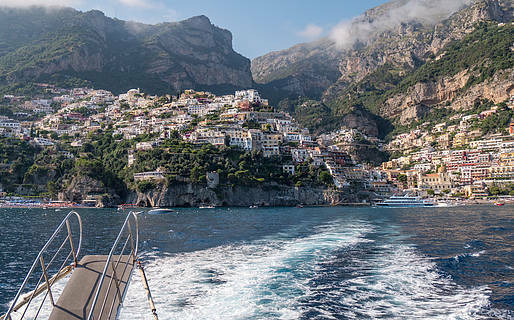 In the summer months, there are also Capri - Amalfi Coast ferry connections. Those who have always fancied sailing the seas in authentic Capri style can rent a boat, with or without skipper, in the harbor of Marina Grande. 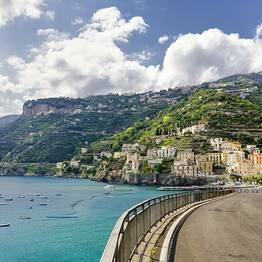 From Punta Campanella and the Sorrentine Peninsula, the spectacularly panoramic SS163 highway hugs the entire length of the Amalfi Coast via an infinite series of knuckle-whitening hairpin beds. 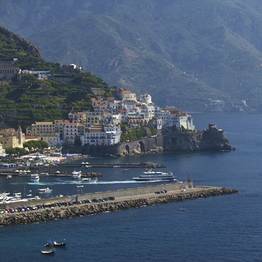 Those prone to carsickness might like to consider taking one of the ferries which, in high season, sail direct from Capri to Amalfi. 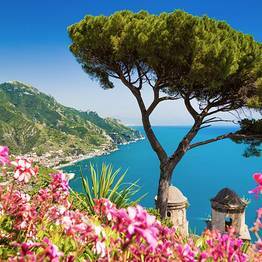 Close to Salerno, the Campania region's second largest seaside city, the town of Vietri sul Mare is famous worldwide for its artistic ceramics and its picturesque little streets are lined with shops in which to purchase items made with the hand-painted majolica. On the way to Punta Campanella, visitors come across the towns are Maiori and Minori, famous for their cakes and for their gorgeous beaches. 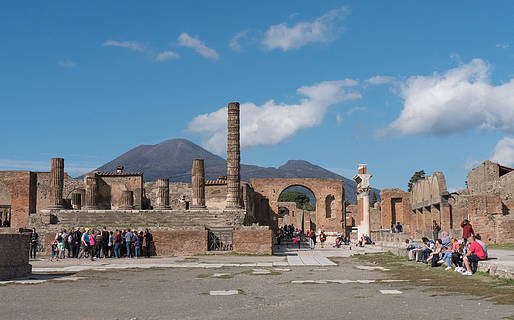 The most visited archeological site in the whole of Italy, if not the world, Pompeii is by far the most famous victim of the 79 A.D. eruption of Mount Vesuvius. Buried under mountains of volcanic ash, where they remained undisturbed for almost 2000 years, the ruins of Pompei include incredibly well-preserved patrician villas, markets, public baths and, hundreds of, eerie but fascinating, plaster casts made using the holes in the lithified ash left by the corpses of the town's unfortunate inhabitants. You can easily reach Pompeii from Sorrento and Naples via the Circumvesuviana train an visit the ruins of this spectacular Roman city by folowing one of the themed routes. Perhaps the most interesting is that dedicated to the villas inside and outside the city walls, including the House of the Faun and the Villa of the Mysteries. Don't miss the thermal baths, a gathering place that was particularly beloved by the ancient Romans and that had an important role in the social life of the city. Discovered quite by chance in 1738, during the digging of a well, the town of Herculaneum was covered by 65ft of burning ash and slag within minutes of the blast cloud created by the eruption of Vesuvius collapsing. Ironically, the speed with which the prosperous and elegant town was buried contributed to its preservation (superior to that of Pompeii) and its evolution into one of the world's most impressive archeological sites. 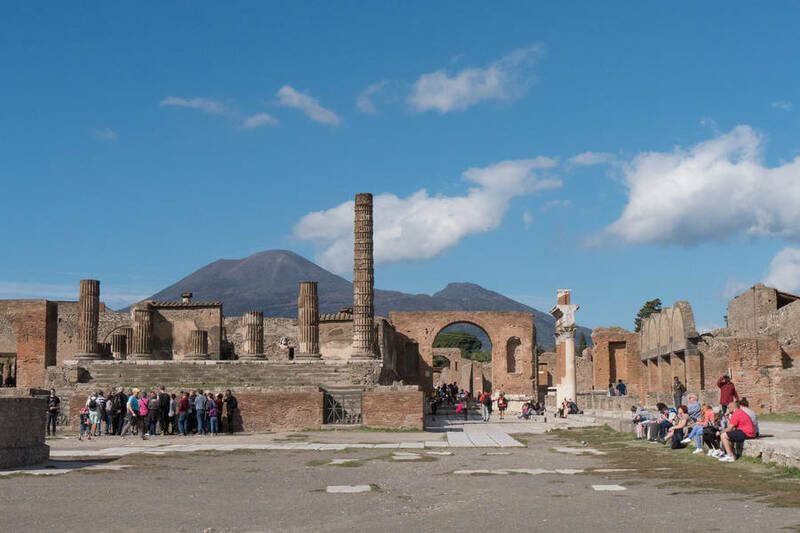 As in Pompeii, there are a number of themed routes to explore and discover the daily life of the city's ancient inhabitants. 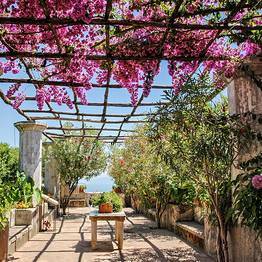 Be sure to visit the Casa del Bel Cortile, the Casa Sannitica, the public baths, and the Casa dei Papiri, a villa outside the city wall where a number of papyrus documents written in Latin and Greek have been discovered. There are often find long lines to enter the Pompeii and Herculaneum archaeological sites, especially in summer. We strongly recommend booking skip-the-line tickets online in advance to avoid wasting time waiting to enter the sites. We do not recommend attempting to visit both archaeological sites in one day, but combining your visit with an excursion to the crater atop Mount Vesuvius is an excellent idea! 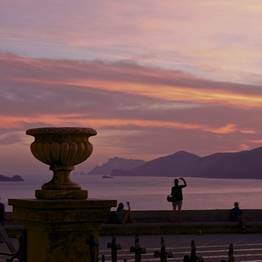 In the summer, from the viewing terraces above the port of Capri, just before sunset, it is not uncommon to spot a procession of little boats heading out to sea in the direction of Punta Campanella and the Amalfi Coast. The destination of many of these boats, with both tourists and locals aboard, will, with all probability, be Nerano. 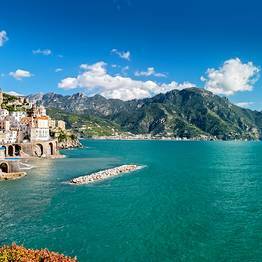 The tiny fishing village of Nerano is, in fact, home to a surprising number of big-name restaurants, serving the region's finest traditional fish cuisine, invariably accompanied by one of the superb wines produced in the Lattari Mountains. 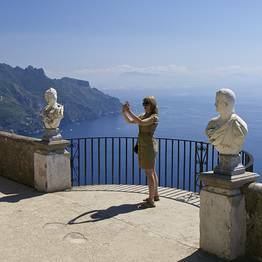 Built on the cliff tops, towering above the sea, Sorrento enjoys views of the entire sweep of the Bay of Naples. 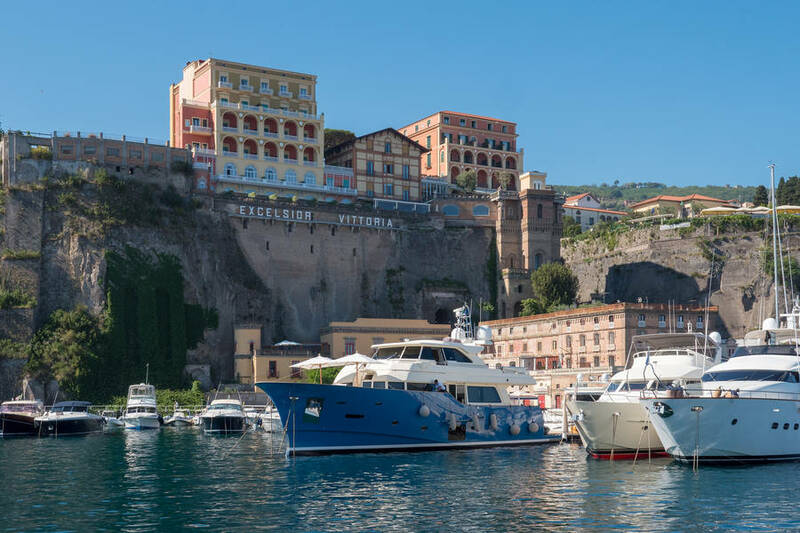 A quick, 20 minute ferry ride from the island of Capri, the harbor of Sorrento lies within easy walking distance of the historic center of this elegant seaside town, which acquired international fame in the 1800's as an obligatory port of call on the Grand Tour. Corso Italia, Sorrento's busy high street, leads to Piazza Torquato Tasso which is dominated by the statue of Sant'Antonio, the town's much-revered patron saint. 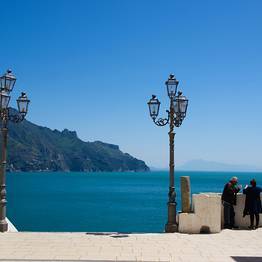 From the Piazza, visitors venture in to the old center of Sorrento, its cobbled lanes brimming with tiny crafts shops and fruit and vegetable stores, the latter offering impressive displays of the town's world famous lemons and festooned with strings of bright red chili peppers. Castellammare di Stabia, just a few kilometers North of Sorrento, is home to one of region's most impressive archeological sites. Yet another illustrious victim of the 79 A.D. eruption of Vesuvius, just like the nearby towns of Pompei and Herculaneum, the town of Stabaie was, for centuries, buried under mountains of tephra ash. Excavation work, initiated in the 1950's, revealed the magnificent architecture and beautiful artworks of the villas and thermal baths of what was once the Roman Empire's summer seat of governance. 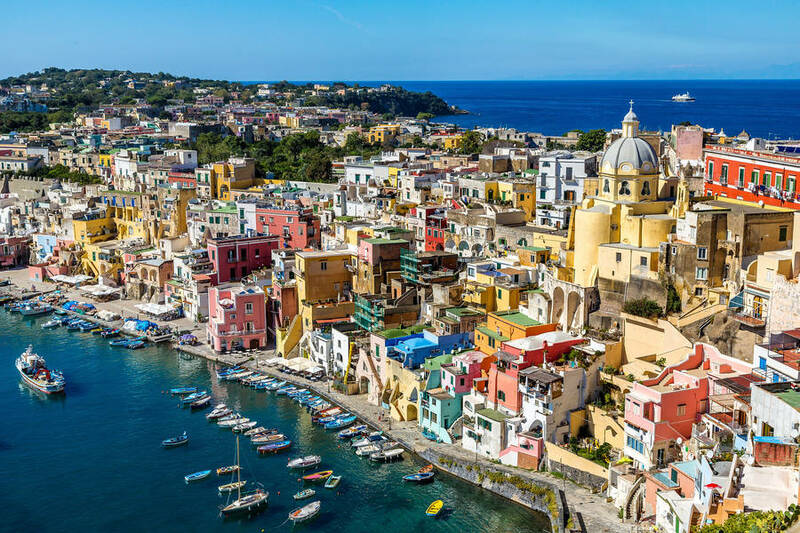 With its brightly painted cottages and fleet of tiny little fishing boats, the picturesque harbor of Procida is invitation enough to pass a few hours on this tiny Mediterranean island. 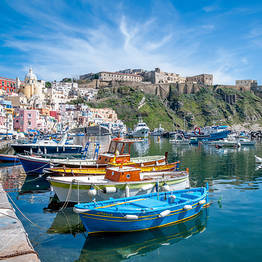 Hours which might easily be spent strolling through the ancient cobbled lanes and beneath the vaulted passageways which characterize the district of Marina Corricella: still inhabited today by the island's fishermen and their families, or bathing in Procida's crystal clear sea, rich in marine life. Visitors reach the promontory of Terra Murata, the historic center of Procida, via a spectacularly panoramic road overlooking Marina Corricella and the sea. This is where the island's most impressive work of architecture, the Abbey of Saint Michael Archangel, was erected back in 1026. Today, the underground floors of the Benedictine Abbey house a museum and a library containing over 8000 volumes of printed books and manuscripts. 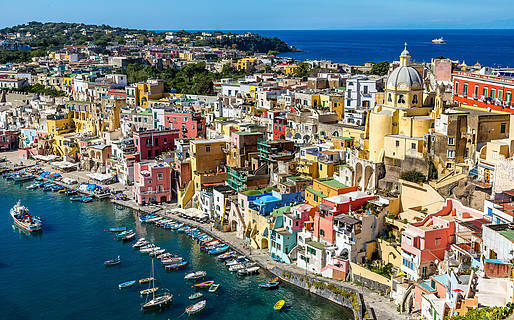 An oasis of peace and tranquility, Procida seems to have no intention of courting the crowds of tourists which swoop down on its more glamorous neighbors. A favorite destination among nature lovers and scuba divers, the island's Silurenza, Lingua and Ciraccio beaches catch the sun from dawn until dusk. 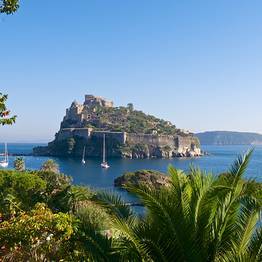 Often referred to as the "Isola Verde" (Green Island in Italian), it is, in fact hard to find much more than a few square meters of the island of Ischia which is not covered in lush vegetation. The incredibly fertile soil is just part of the precious inheritance left to today's inhabitants by the island's volcanic past. Then there is the thermal water and volcanic mud, the therapeutic properties of which had already been discovered in Ancient Roman times. Whilst, Ischia's thermal springs fuelled the arrival of international tourism in the 18th century, it was not until the 1960's that the island's spa industry definitively boomed. 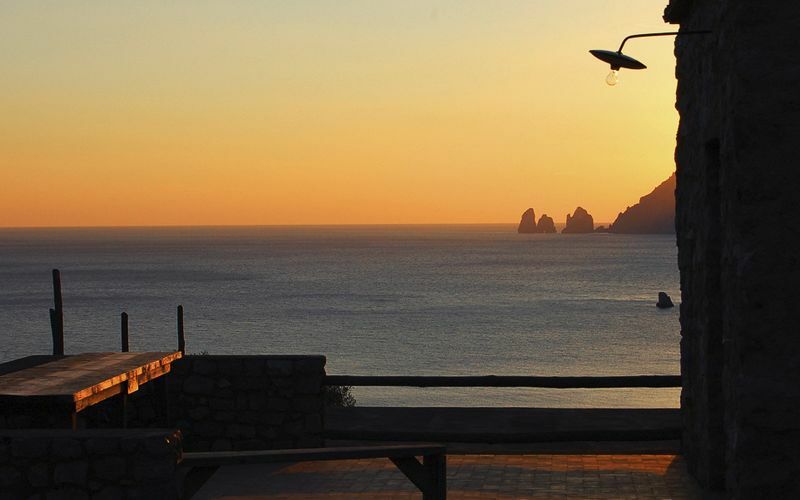 Since then, an ever-increasing number of luxury spa hotels and resorts have been built here, making Ischia the Italian wellness destination par excellence. 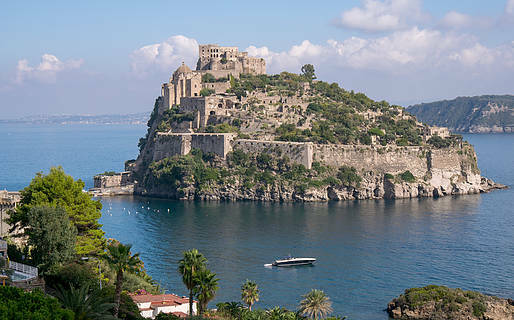 The island's thermal stations are by no means the only attraction and, if lolling in mud is not your scene, Ischia has many fabulous beaches where you can enjoy the sun and swim in the wonderfully warm Mediterranean sea which washes its shores. 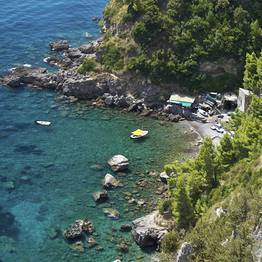 In addition to the famous San Montano, Maronti and Lido beaches, there is a host of small, secluded coves and inlets, many of which are only accessible from the sea. 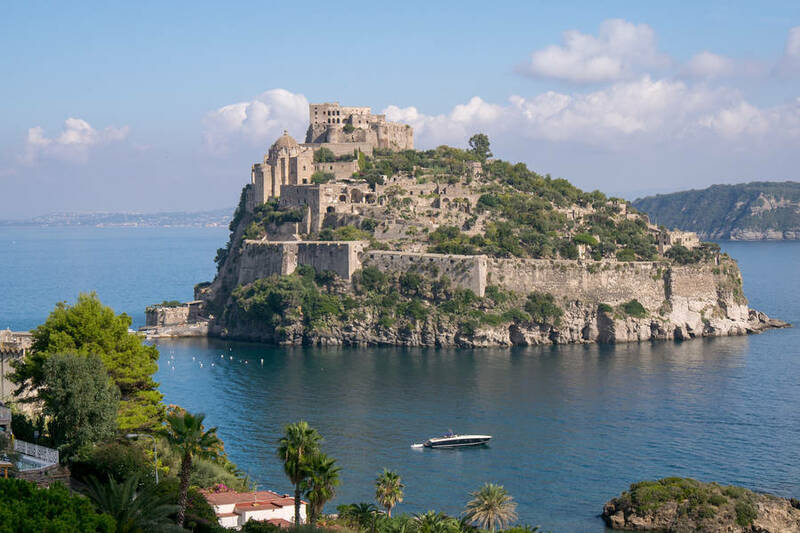 The picturesque fishing district of Ischia Porto is a major tourist attraction, as is the magnificent Castello Aragonese: built by Alfonso of Aragon in the mid 15th century. Constructed on a little islet, the site of a number of previous strongholds, the imposing 113meter high castle is linked to the old district of Celsa by way of a 722ft long bridge. 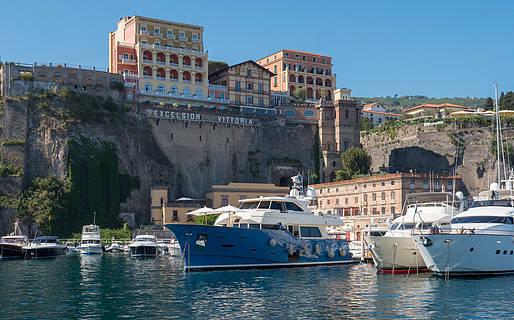 Ferry connections between Capri, Ischia and Procida operate exclusively during the summer season and even then on a once or twice daily basis only. 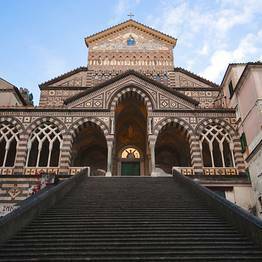 As an alternative, travelers can head first to Naples before boarding a second ferry to the island of their choice.